A Long Range Technology Plan helps districts to efficiently and effectively use technology to ensure students, parents, educators, administrators and support personnel have the support necessary to achieve Northwest ISD’s Mission and Vision. The objectives in this plan support a culture of Future Ready learning through alignment with the Visioning Document, Profile of a Graduate and Profile of an Educator, and supporting teaching and learning. The Long Range Technology Planning Committee, comprised of administrators, teachers, students and parents, collaborated over a period of three months to define the goals and strategies. The committee used Profile of a Graduate, Profile of an Educator, the District Strategic Goals, the State Long Range Plan, the Visioning Document and the Future Ready Initiative to guide development. Upon completion of the first draft, the plan was presented to curriculum and instruction for feedback. The plan was then brought to principals and district leaders for feedback and improvements were implemented in the plan. On May 9, the Long Range Technology Plan was approved by the Board of Trustees. 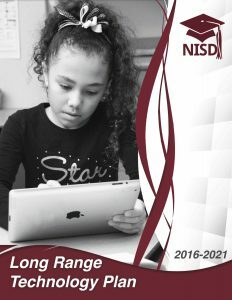 During the long range planning process, the committee also collaborated on defining Student’s Device Standards: A student device supports Future Ready learning by providing access to relevant technologies, tools and resources for individualized instruction, while promoting student-driven learning. A student device allows for opportunities for self-sufficiency, digital responsibility and lifelong learning by providing tools that cultivate choice and the Four Cs (communication, collaboration, creativity and critical thinking). These standards will play a key role in guiding the selection of future devices for Northwest ISD students. For more information and to review the completed Long Range Technology Plan, please visit here.